Tripoli, Libya (CNN) -- An airstrike Saturday hit a parking lot outside the compound in central Tripoli of Libyan leader Moammar Gadhafi, killing three people, a government spokesman said. Musa Ibrahim said he had no information about the identities of the dead in the attack on the compound, called Bab el-Azizia. The attack, presumably from NATO forces, came shortly after Deputy Foreign Minister Khaled Khaim announced that Libya's army will withdraw from the besieged coastal city of Misrata and allow tribal leaders to attempt to deal with the rebels. "The situation in Misrata will be eased and will be dealt with by the tribes surrounding Misrata," Khaim told reporters. "You will see how they will be swift and quick and fast." He added that the residents of Libya's third-largest city have been in the grip of the conflict. "The tactic of the Libyan army is to have a surgical solution, but it doesn't work," Khaim said. "With the airstrikes, it does not work. We will leave it for the tribes and Misrata people to deal with the situation -- either to use force or negotiations." He added, "The tribal leaders have issued an ultimatum to the military saying they will deal with the situation if the military cannot do it. ... They will speak with the rebels and, if there is no solution, they will fight the rebels." In the rebel stronghold of Benghazi, in the east, rebel spokesman Ahmed Bani reacted to Khaim's comments with laughter and derision. "This only confirms that he wants to save face," Bani said of Gadhafi. "This confirms that our rebels in Misrata have liberated Misrata and that Libya is still in one piece, not two, the way Gadhafi hoped. In regards to the tribes fighting the rebels; how would you believe that a person will fight his brother? And who are the tribes that are supporting Gadhafi, anyway?" He predicted that if Gadhafi forces leave Misrata, "it will mean that this game is over." But he added that he did not necessarily believe they will. Earlier Friday, Bani said that Libyan rebels had wrested control of a key building in Misrata and made other advances in the city. "This victory is quite important for us, and it shows that we are advancing and we are heading in the right direction," Bani told CNN about the rebels' control of the National Insurance Building, which is on the main thoroughfare, Tripoli Street. Its height provided snipers with a clear view of surrounding streets. Bani said some fighters loyal to Gadhafi were negotiating to surrender their weapons to the rebels in exchange for the rebels' assurances that they would not be harmed. But the carnage of recent days was on display at the city's hospitals, where doctors were working long hours and beds were full. Gadhafi's forces retain control of roads that lead to the seacoast city. But access by sea remains open, and on Friday another aid ship chartered by the International Organization for Migration left Benghazi for Misrata carrying food, medicine and other supplies. The organization said it hopes to rescue more casualties and stranded migrants from the city. "Given the increasing number of casualties in Misrata and the thousands of lives that are in danger, we felt a responsibility to act," said Foreign Minister Eamon Gilmore of Ireland, which is helping fund the chartered vessels. "Colonel Gadhafi's forces have agreed to allow ships into the port to evacuate civilians and we have requested that the IOM undertake an emergency operation on our behalf," Gilmore said. At a news conference in Baghdad, America's top military chief acknowledged a stalemate on Libya's eastern front, around the oil towns of Ajdabiya and al-Brega, both of which have changed hands several times. "The regime forces have changed their tactics, and changed it in a way where they essentially look like the opposition forces, so it's become a much more difficult fight," U.S. Navy Adm. Mike Mullen, the chairman of the Joint Chiefs of Staff, told reporters. "And as I've observed in recent days, essentially it is very much stalemate-like in the vicinity of Ajdabiya and al-Brega," Mullen said. He said the outcome -- toppling Gadhafi after nearly 42 years of rule -- is certain. But the timing, he said, is "difficult to predict." 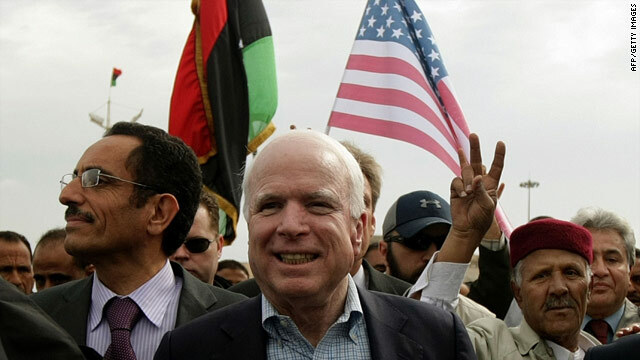 Also Friday, Sen. John McCain made an unannounced visit to Benghazi, the rebel stronghold, where residents welcomed him. Some waved American flags, some chanted, "Thank you John McCain! Thank you Obama! Thank you America! We need freedom! Gadhafi go away!" The senator from Arizona's arrival came a day after the United States said it was deploying drones to Libya. McCain, a proponent of beefing up U.S. efforts to oust Gadhafi, said the drones will increase NATO's capability but not enough to break a "significant degree of stalemate." Though he opposes sending U.S. ground troops to Libya, he said the international community needs to "facilitate" weapons and training for the rebels. McCain, the highest-ranking U.S. official to visit Libya since the conflict erupted in February, challenged critics of intervention to tour Benghazi, as he did Friday, to see a "powerful and hopeful example of what a free Libya can be." The top Republican on the Senate Armed Services Committee stopped by a hospital and suggested that Western powers are not doing enough for the rebels. "Let's face it: This is not a fair fight," said McCain, a decorated Vietnam veteran with clout in defense circles. "Maybe we should be doing everything we can to help these people and maybe we're not, and they're dying." U.S. 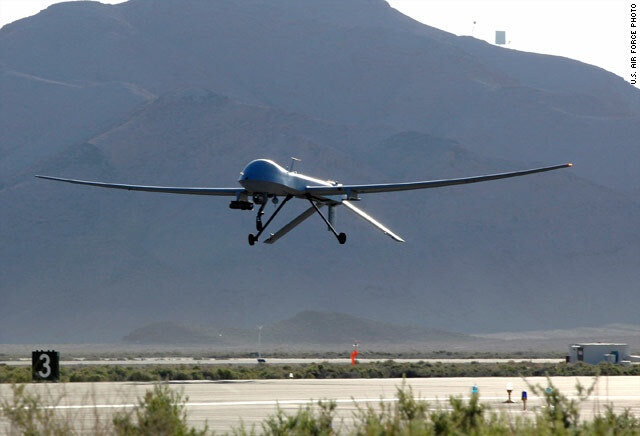 Predator drones were deployed Thursday in the North African nation as part of the NATO-led military efforts there. But as of Friday night, the drones had made no strikes, said a Pentagon spokesman, Navy Capt. Darryn James. U.S. Defense Secretary Robert Gates said earlier that bad weather forced the deployed drones to return. Libya's deputy foreign minister told reporters that the decision reflects poorly on U.S. President Barack Obama. "He is involving himself in a dirty game," Khaim said. "This is will be another crime against humanity committed by the American administration and I feel very sad for President Obama to be involved in such a thing." CNN's Reza Sayah, Saad Abedine, Frederik Pleitgen and Barbara Starr contributed to this report.